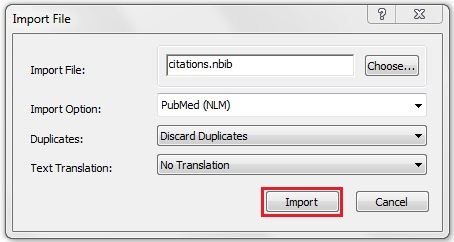 Note: If your citations do not export properly into your EndNote library using this Fast and Easy method, please refer to the instructions below for the Tried-and-True method. 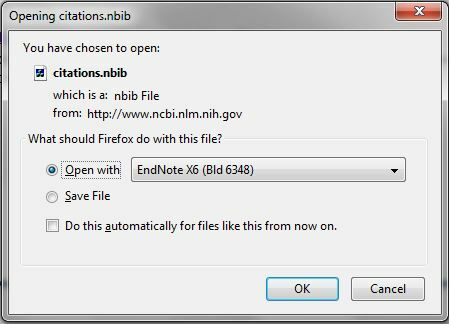 Mac Users: When working with EndNote on a Mac, you must use Mozilla Firefox as your browser to enable Direct Export (automatic downloads) of references from electronic databases (PubMed, Web of Science, etc.) to your EndNote library. Conduct a search in PubMed. Check the boxes next to articles for the citations you wish to download. If you're conducting multiple searches, save items to your Clipboard, a temporary storage space in PubMed. You can do this by selecting Clipboard from the Send to menu. If you do this, a Clipboard icon and the number of items on the Clipboard will be displayed at the upper right of the page. To view the items on your Clipboard, click on the items link next to the Clipboard icon. Once you are ready to export your results, click the Send to menu at the upper right corner of your results or Clipboard. Select Citation manager. Then, click the Create File button. A dialog box will appear prompting you to either "Open" or "Save" the text file that you are creating. 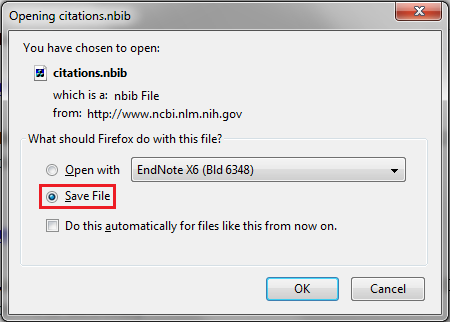 Choose the Open with radio button and select EndNote from the drop-down menu. If you do not see EndNote on the dropdown shortlist, select Other and choose EndNote from the options provided. Then, click OK. Your citations will automatically appear in your EndNote library. If you do not already have EndNote open, your computer will open your EndNote library. Important: Check all citations for accuracy prior to sorting into groups. Note: Some computers have trouble automatically exporting citations from PubMed into EndNote. If the Fast and Easy method does not work, then use this Tried-and-True method. A dialog box will appear prompting you to either "Open" or "Save" the text file that you are creating. Choose the Save File button. Then click OK. The file will be saved to your computer; note where the file is saved so you will be able to find it in the next step. You have successfully exported your citations out of PubMed and are ready to import them into EndNote. Go to EndNote and open the library where you want to store your references. Click on the File menu and select Import > File. The Import File dialog box will appear. Click on Choose and select the file you just saved from PubMed. Under Import Option, click Other Filters. This will take you to the Choose an Import Filter dialog box. 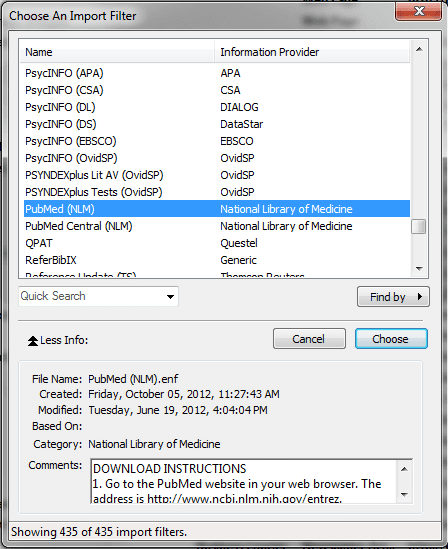 Select PubMed (NLM). Click Choose. This will take you back to the Import File dialog box. Under Duplicates, it is recommended that you select Discard Duplicates from the drop-down menu. This will import all references except duplicates. Click on Import when you have finished. Your references from PubMed should now be in your Endnote library. Note: Once you have gone through these steps one time, PubMed (NLM) will appear in the Import Option drop-down menu the next time you import a file.